Baume et Mercier (bohm ay mers-yay) is a Swiss luxury watchmaking company founded in 1830. It is owned by Richemont, and with Cartier and Piaget they make up the core of the group. This company is represented in 75 countries and produces around 200,000 watches a year. The most important markets are in Europe, especially Italy, Spain and France. Baume et Mercier is distributed by 220 exclusive retailers worldwide and has established itself as a manufacturer of sporty chronographs..NB WE REMIND YOU THAT A LOT OF OUR WATCHES ARE SOLD BY US FOR OUR CUSTOMERS...THIS MEANS THAT IF YOU WANT TO COME IN OUR SHOP TO SEE ONE OF THEM YOU HAVE TO CONTACT US TWO OR THREE DAYS BEFORE IN ORDER TO LET US TO HAVE THE TIME TO BRING THERE THE WATCH! 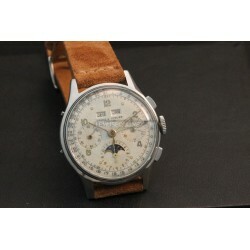 Steel case ( diameter 36mm ) Hand winding movement caliber 88 Brown leather strap Beautiful original dial With chronograph With triple date calenda and moon phases Plexi glass Reference 1919 Made in the '50s Rare model Very nice conditions!